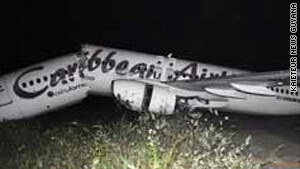 The Boeing 737 was arriving from Port of Spain, Trinidad, Caribbean Airlines said in a statement. (CNN) -- The 157 passengers and six crew members aboard a Caribbean Airlines plane were safe after it crashed at the airport in Georgetown, Guyana, Saturday morning, the government said. The incident happened at about 1:30 a.m. at the Cheddi Jagan International Airport. For reasons under investigation, the plane was unable to come to a stop on the runway and crashed into a grassy patch, government spokesman Roger Bhulai told CNN. Several people suffered broken hands, ankles or light head injuries, but there were no fatalities, he said. Several passengers were transported the hospital, though the exact number wasn't immediately known. The plane's fuselage split in front of the wings, but did not separate from the plane. "The plane ran off the whole runway," Bhulai said. The back wheels of the plane touched the runway, but it became unstable when the front wheel touched down, he said. "It started to wobble when it landed," Bhulai said. The Boeing 737 was arriving from Port of Spain, Trinidad, Caribbean Airlines said in a statement. The flight originated in New York. "The airline's primary concern at this time is for those on board the aircraft and their families," the airline said. Once the plane had come to a stop, the passengers exited from the rear door of the plane, which was lower to the ground than the middle door, Bhulai said. People had to jump out the back door because for some reason the emergency chute was not deployed, he said. The crash landing was shocking news in Guyana, a former Dutch colony and British territory that gained its independence in 1966. It has a population of nearly 750,000. The country's president, Bharrat Jagdeo, went to the scene, along with several of his Cabinet ministers. Jagdeo walked around the plane and talked to passengers for a while at the scene, Bhulai said. The airline said it was dispatching several officials to Guyana as well. The airport was closed Saturday morning and at least one flight was canceled. It was expected to resume operations as normal by noon.